o.r.i.g.i.n.a.l est un front-end php pour gallerie Web. 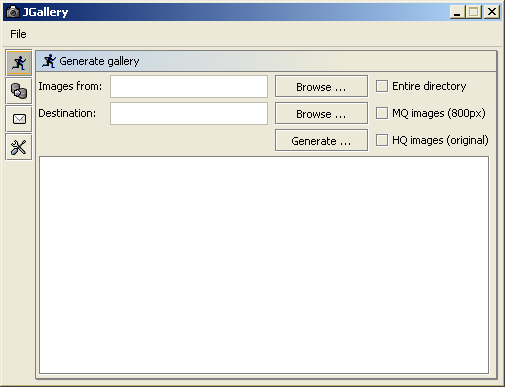 JGallery 0.1 est un utilitaire Java que j’ai développé pour générer les images (index, …) sur lesquelles se base le front-end pour générer les pages html. Suivez les instructions sur la page de téléchargement. This is a great spot to put a small blurb with some information on what your blog is all about. Use a "Text" widget in your "Wide Sidebar" sibebar options in Wordpress. Whatever you put in the title will show about and whatever you put as text (or html) will show right here! A handy thing about the sidebars in this theme is that they are split into multiple sidebars, and they are all labeled nice and neatly in the options. There is a Wide, Left and Right Sidebar, along with a Left, Mid, and Right Footbar (scroll down!). You can place anything into any of them! © 2009 Pascal Abaziou - Photographies. All Rights Reserved.